The stories are as infamous as the artists who tell them. With their boasts of drugs, extortion and even murder, in today's world rappers need rap sheets before they can even hope to have a platinum record. So with all this grandstanding about their criminal nature, why haven't more hip-hop artists been busted for the crimes that they brag of, and why haven't high profile crimes replete with witnesses and media coverage ever been solved? Derrick Parker knows why. A veteran of the NYPD, Parker served as the lead detective in the -Rap Intelligence Unit, the first special force devoted to hip-hop crime. For over twenty years he served on the force, covering the hip-hop beat and uncovering the truth behind some of music's most notorious crimes. But in the midst of politics and internal strife, Parker's efforts to close the cases were stymied by the NYPD. Notorious C.O.P. will be the Serpico of the new millennium, exposing the flaws in the NYPD that have rendered them unable to adequately deal with the threat of hip-hop crime. From cops working part-time for the artists they are supposed to be pursuing, to their lack of understanding of gang culture and drug warfare, which has left not only these widely publicized murders unsolved, but has allowed notorious gang leaders to go unprosecuted for decades. Filled with photos, documents, interviews, and anecdotes, Notorious C.O.P. 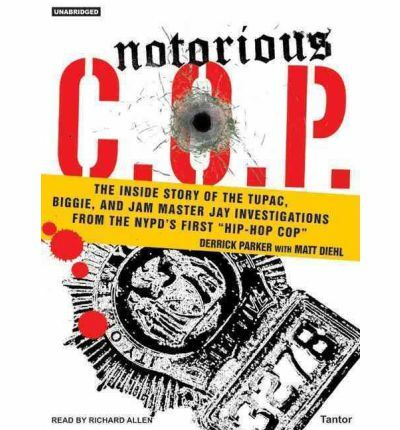 will be the most extensive and authoritative book ever written on hip-hop crime, exposing the facts behind the legends and the foibles of the NYPD that have left them unresolved to this day. About the Author: A twenty year veteran of the NYPD, Derrick Parker headed the first special units force dedicated to the investigation of hip-hop related crime. Now off the force, Parker serves as media's rap-related crime expert, appearing in Rolling Stone, New York Magazine, Blender, Vibe, The New York Times, Newsday and dozens of other magazines and newspapers as well as shows on MTV, Fox, VH1, Unsolved Mysteries and Court TV. Matt Diehl is a journalist whose work has appeared in Rolling Stone, The New York Times, The Washington Post, GQ, VIBE, Spin, The Village Voice and Blender. He served as the music columnist for Elle magazine for four years and is currently Contributing Music Editor at Interview. He is the author of "My So-Called Punk" and "No-Fall Snowboarding,"Matt Diehl is a music journalist. His work has appeared in "Rolling Stone, The New York Times, The ""Washington"" Post, GQ, VIBE, Spin, Blender "and many other publications. He served as the music columnist for "Elle" for four years and now serves as a contributing music editor at "Interview," He has appeared as a music expert on MTV and was co-producer of the acclaimed five-part television series on VH1, "The '70's," His books include "No-Fall Snowboarding" and "Notorious C.O.P.."Richard Allen and S. Ishii Gonzales both teach at New York University, where Richard Allen is Chair of Cinema Studies.